Capodimonte “Made in Italy” factory, maker’s marks, and trademarks, have changed over the years; from a simple crude fleur-de-lys, to the famous “N” and Crown recognized today. 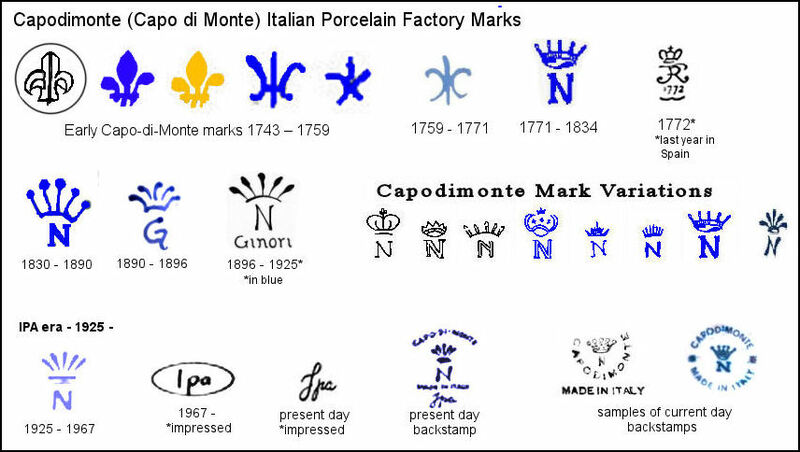 It would be very rare for a collector to find a pre-1900 figurine or piece with an early Capo di monte Fleur-de-lys mark, but the chart and timeline below show the marks that were used for Capo-de-monte porcelains from then until now. Both by the original Royal Factory, and the independent porcelain factories that grew around the Royal franchise. The early Capodimonte pieces that were created before the first “Royal Factory”, (pre-1743), used the Fleur-de-Lys symbol. The Fleur-de-Lys in a circle was impressed or inscribed on most pieces, while the solid Fleur-de-Lys was a painted under-glaze mark in either blue or gold. The two “stylized” Fleur-de-Lys on the right of the above image were primarily used on service-ware pieces that were not deemed as “artful” as the pieces with the two above-left Fleur-de-Lys. This was the period when King Charles III moved the Capodimonte production to Spain when he became Spain’s King Charles I. Although the porcelain was exactly the same, it was officially Spanish porcelain during this period. 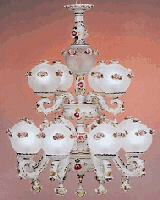 This blue “stylized” version of the original Capodimonte Fleur-de-Lys was used for production from the Spanish Buen Retiro factory near Madrid. The first use of the Neoploitan “N” topped with a 5-point crown, (coronet), was in 1771. 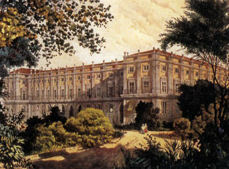 Spanish King Ferdinand I was having a Royal Factory built in Naples, and even though it was not completed until 1772, the blue “N” and crown were used for production pieces made that year in the Spanish Factory, and continued to be used after the manufacturing process moved back to Naples – until 1834. Important Note: The Neapolitan “N” and crown were never trademark protected. There have been many variations with different fonts of the “N” and different styles of the crown or coronet. 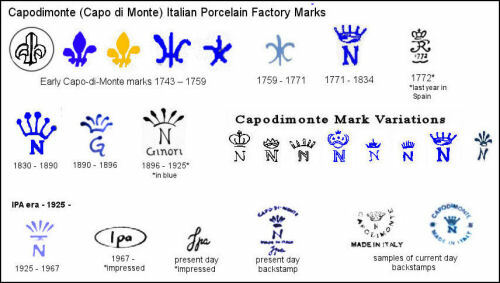 Technically any porcelain maker could use the mark and claim to be Capodimonte porcelain. And many have. To be sure of the authentication, other factors must also be considered, such as; factory marks and back-stamps, even design and artist styles that are known and recognized. 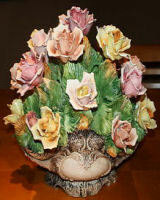 This Capodimonte mark was used for the last year that Capodimonte was made in the Spanish factory in Buen Retiro, Spain. 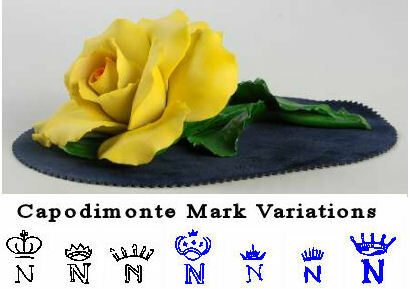 This version of the Capodimonte mark, (5 points representing a crown, but not drawn as a crown), was used by the Ginori factory in Doccia, Florence. Ginori only represented their porcelain as Capodimonte. It was not made in Neapolitan factories, so at this time it was not “true” Capo-di-Monte porcelain. 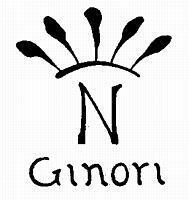 This version of the Capodimonte mark with the name “Ginori” under the “N” was used by the Ginori factories that supplied their “Capodimonte-Style” porcelain to six retail shops. One of which was in Naples. 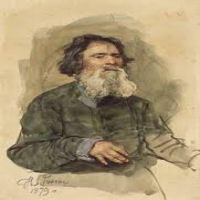 After the Royal Factory closure in 1834, many of the “King’s” artists and modelers split off to open their own studios. By 1925 there were many Italian porcelain factories making Capodimonte-style porcelains, and using the famous “N” and crown. One studio, the Industria Lombardo Porcellane Artistche, (ILPA), founded in 1925 by Signora Carozzi, became dominate. 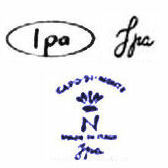 ILPA later grew to become IPA, (Industry of Artistic Porcelain) — a very large porcelain company that began using its own mark in 1967. Both alone, and with the “N” Crown and text. Note: References to “Capodimomte by IPA” are references to origins – not designing artists. 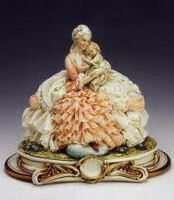 See examples of available marked Capodimonte porcelains. 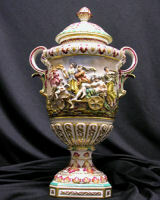 **See Capodimonte and Capodimonte-style Italian Porcelain pieces for sale Now!